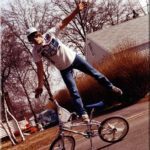 The five people I am going to mention are here because they, to me at least, defined BMX freestyle for myself and the people I knew in New Jersey during its infancy. 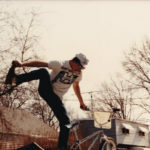 I have had MANY BMX friends over the years and they have all influenced me in many ways, and if not influenced actually helped me run, setup and organize things I have done in BMX. 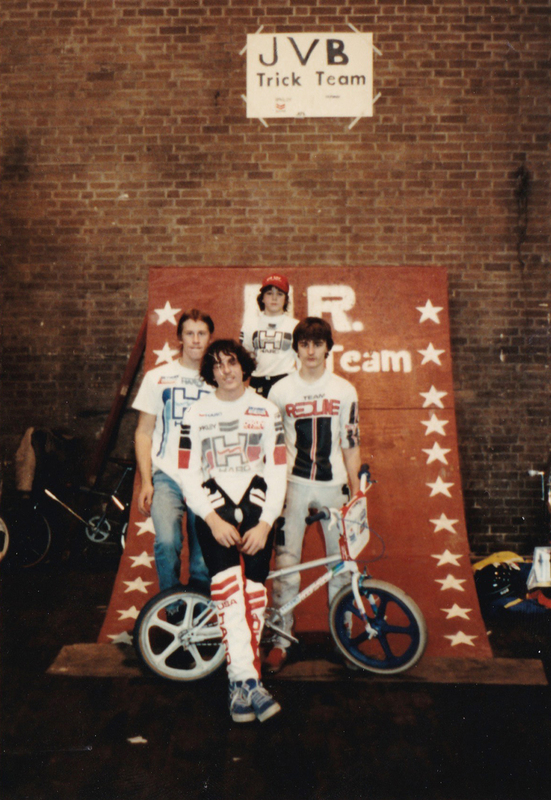 If you are not on here, it is not because I didn’t think about you, it’s only because these five are the people who created the beginnings of the legend of BMX freestyle in NJ. Pictured below: The original NJ trick team. 1/4 pipe built by me and Tom. Designed by his Dad. It was trucked to the Jersey City Armory in the winter of 1984 to 1985 for a show there. 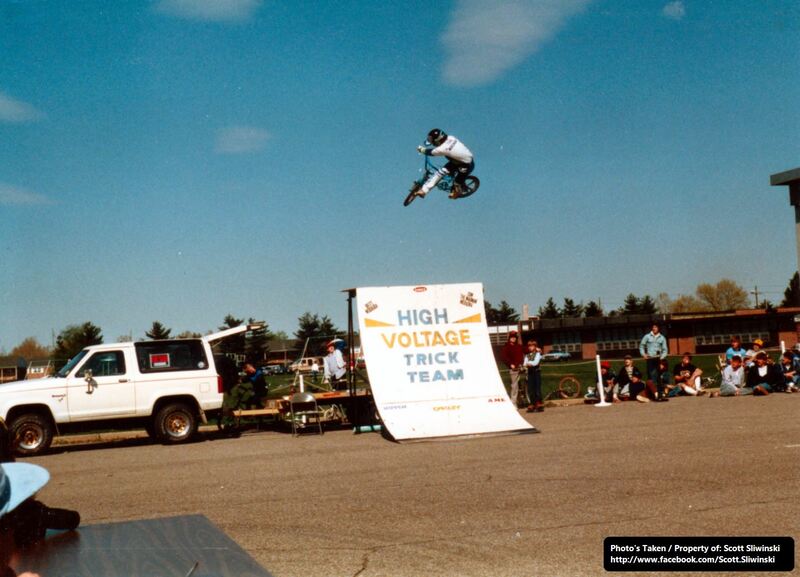 Although it says JVB Trick Team, it was, at that time, the MR (Middaugh Racing) Freestyle Team. There we did NJ’s first freestyle demo by NJ freestylers. 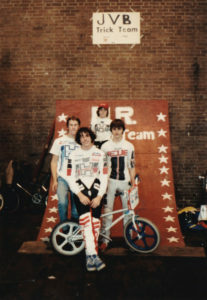 Left to right, the OG’s of NJ Freestyle: Dan Menapace, Brett Middaugh, Rob Giarretta and Tom Nieradka. 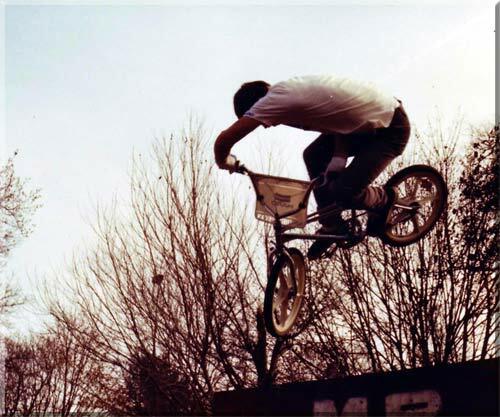 The Golden Age of NJ BMX Freestyle. We may not have been the best ever, but we were first. 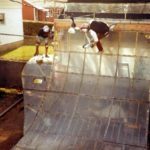 Without Dan Menapace there would have been no High Voltage Trick Team. 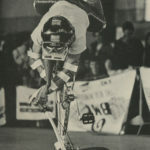 Without Dan, there would have been no metal short ramp for the HVTT. 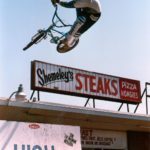 Without Dan, many riders who went on to become big in NJ would not have had someone to look up to. I had heard stories of Dan Menapace for a couple years and when I finally met him, I was blown away. This guy had 20″ bike riding on lockdown. He rode, EVERYTHING. Trails, flat, kick turn ramps, 1/4’s, halfs, street. 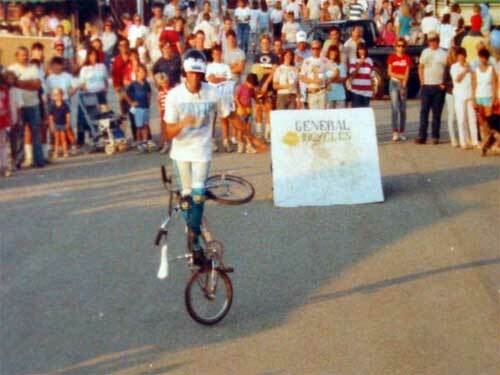 He was the Bob Haro and RL Osborn of our area. He was also looked up to by many people who were and would go on to become legends in the skate industry in NJ. 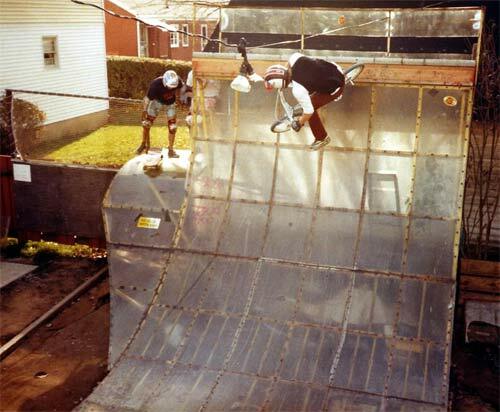 Tom Groholski, he jammed his half pipe. Zoo York creator Rodney Smith? Yep, looked up to Dan. Legend is not a word that should be thrown about with ease, with Darryl it is well deserved. I never knew Darryl. Ever. All I knew of him I heard from Ocean County locals who would ask us if we knew him while we did shows in the area or were down there riding. People would ask us if we knew Darryl and then avail us of his exploits. 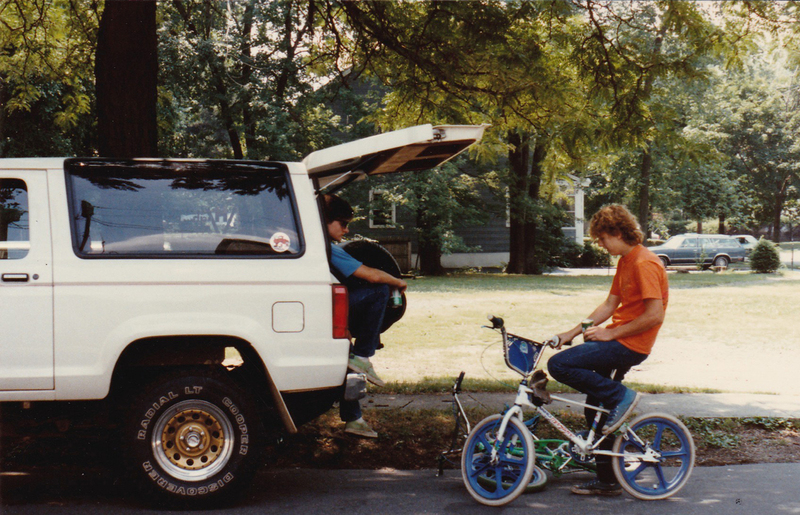 Bunnyhopping cars, backwards drop ins on the HARO ramps. 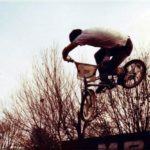 Blasting out of the crowd at Bicycle World’s HARO show and going bigger and higher than anyone on their team. When I would hear about this, my first thought was, “no way”…my second…being who I was back then, was, “Man I would love to get that dude on my team to do shows!”. Alas, I never met him. A real bummer. Later I would learn more about Darryl when I met a friend of his from that era, Mark Sisom and he told me all about his antics. 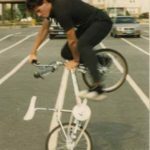 Someday, someone is going to leak out all the stuff this guy did in an interview and BMX in NJ will have the take of the legend revealed. For now look in amazement at the photo below. North Jersey’s pioneer and General seed. Without Steve Rulli and his non-rider counterpart Harry Myers, RL Osborn would never have had a job! LOL! Steve was the man who made it all happen in NNJ. Recognized by his peers as a true innovator, Steve was at the top of the expert class in the early days in the area. General’s first sponsored rider, Steve was the one who made the later halcyon days at General, where I would eventually get a shot at running their team for two years, the great days they were. 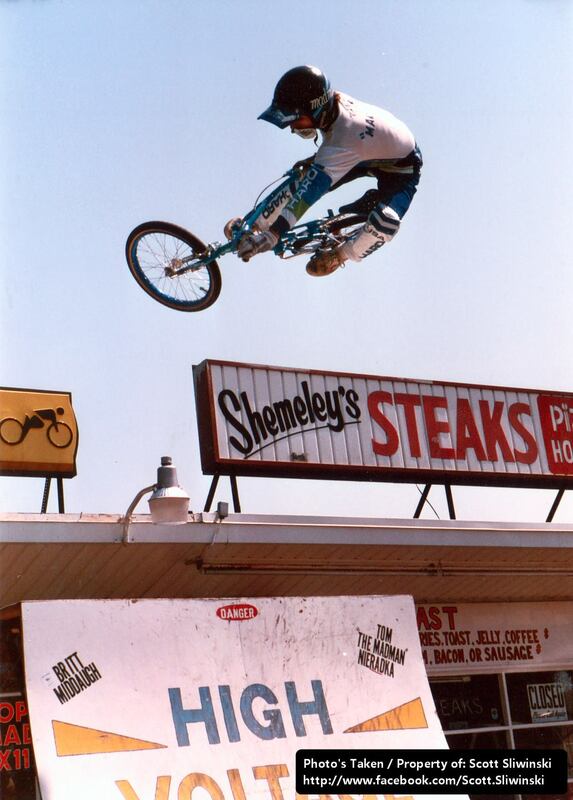 Steve had a great attitude and truly made BMX freestyle happen in NJ. 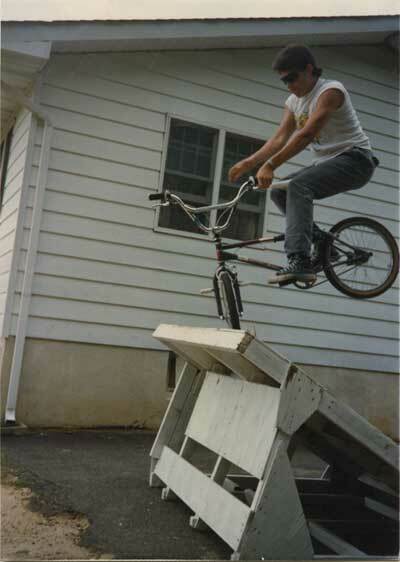 He was also the first NJ rider I ever saw, in person, attempt a backwards drop in. 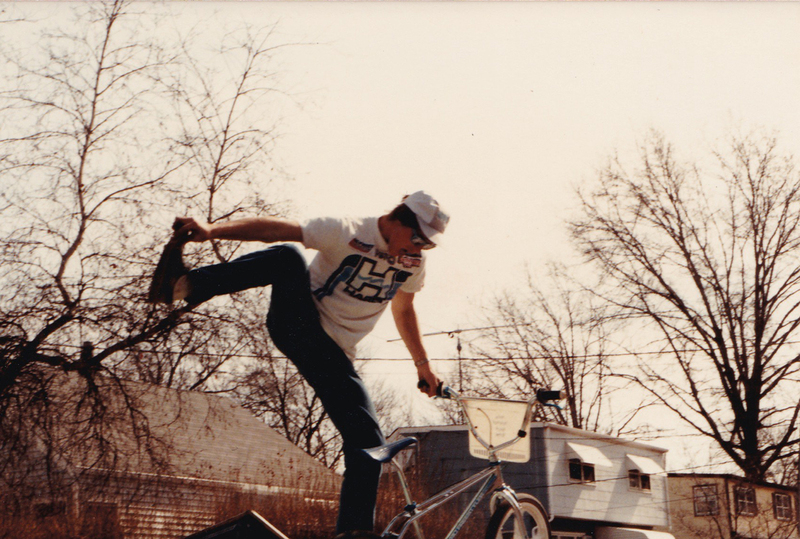 Steve lives in NC now, and shreds it on his MTB. He did it all and did it better than most. No, really, he did. 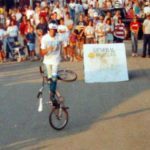 He was the guy who rode ramps, flatland, raced and roadtripped his way to a ton of local titles and accolades. Without Tom, the High Voltage Trick Team would never have gotten as far as it did. 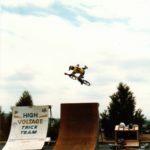 The first rider I ever saw pull a 540 in NJ, Tom was a natural at the 1/4 pipe and was one of a handful of riders in those early days who could bust past the 6′ barrier on the ramp. 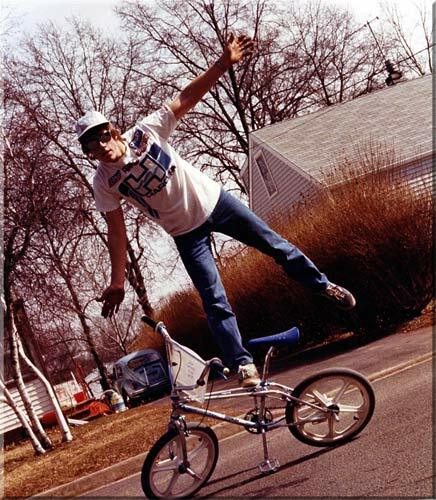 Nicknamed “The Madman”, Tom was actually a very quiet mellow dude off the bike. 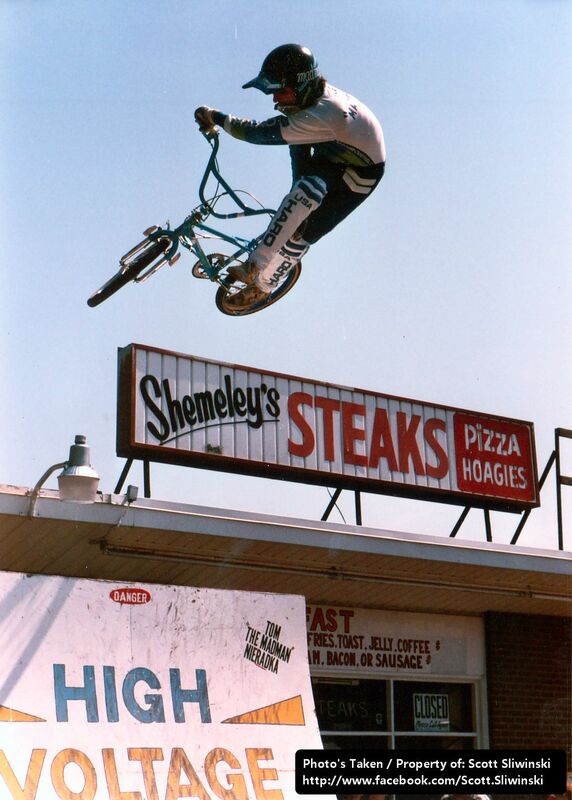 His days at the top were from 1984 to just about 1988 when a bad crash on his backyard, blue whale, half pipe, rang his bell pretty bad and he decided to hang up the pedals not too long after that. 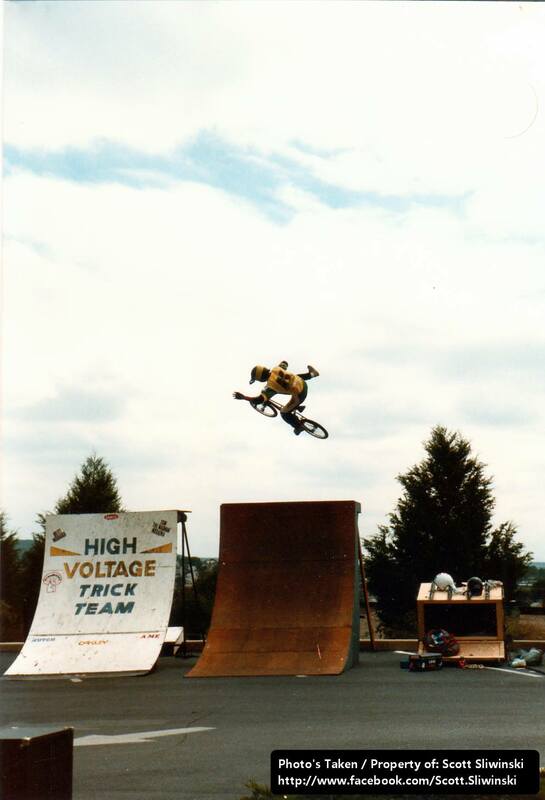 Tom made me believe that the idea of a touring freestyle team from NJ was even possible. He now lives in South Plainfield, NJ with his wife and 2 kids. 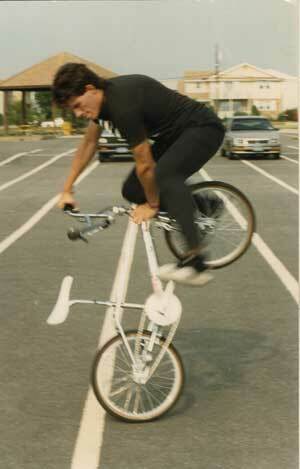 He also shreds at Englishtown drag racing. The competitive edge never leaving him. 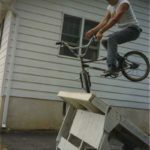 There is more to riding than just pushing the limits of trickery. 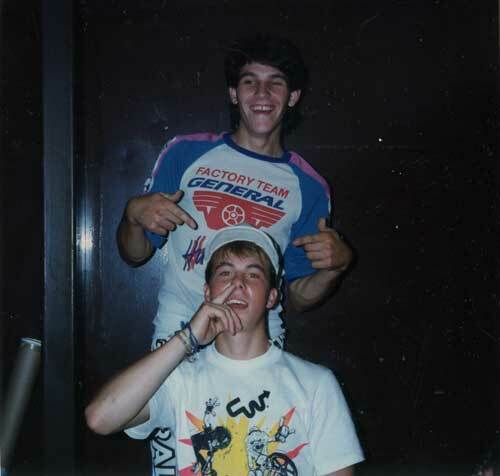 These two guys right here helped get freestyle going in NJ and one of them, uncredited, wast the first NJ freestyler ever in Freestylin’ Magazine. Chris and Matt Young were two brothers from South Plainfield who rode their asses off and pushed the limits of freestyle at that time. Most importantly they had a Mom who was willing to allow us to put a 1/4 pipe in their yard and bomb across the road in front of their house to hit it! 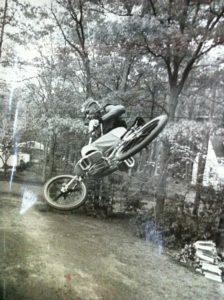 Younger brother Chris was one of the first guys in our area to blast major air. 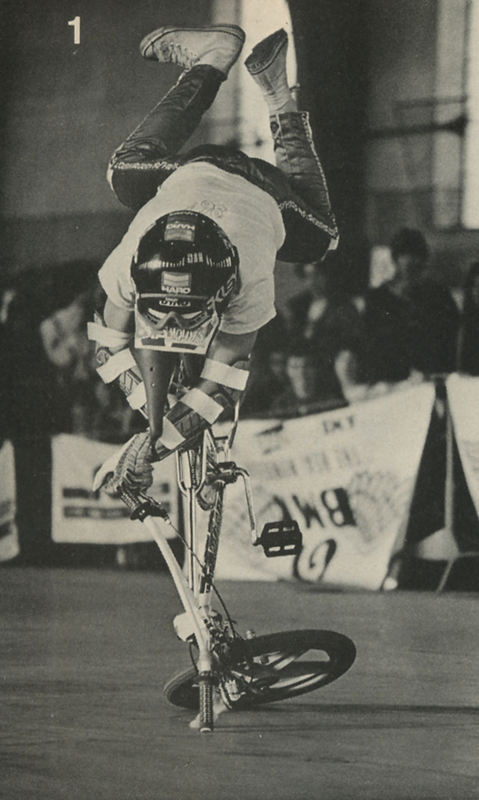 Pictured to the right is the iconic photo of Chris doing a bar endo on the ragged edge of losing it, shot by Osborn and featured in Freestylin. To the left is Matt in the orange shirt, chilling with Tom. 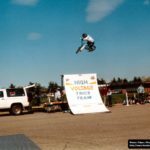 Matt was an integral part of the early days of me getting the HVTT rolling as we had no one to announce and finding someone who knew what we were doing and how to get crowds pumped was in serious short supply. Matt stepped up and got the job done. Later Matt would go on to do radio work for the legendary WSOU radio out of Seton Hall. These two kids made freestyle happen in its infancy and we should all be a little indebted to their ingenuity and creativity in making things that never happened before a reality in NJ.